I didn’t get a lot of reading done this week as I wasn’t feeling well. However I am coming right and that is something I really appreciate! Also I wasn’t feeling like visiting blogs but now up and active again! The weather has been glorious although I think due to break. I walked on the beach the last two days and it felt like paradise. I finished The Sound of Glass – one that I really liked, definitely one for my keeper shelf. I know this one was well received when it published but I waited for the paperback to arrive as the hardback was too expensive! Still listening to Come from Away by Genevieve Graham. I was happy to hear that it continued on with the next generation from the previous book of hers that I had listened to. I am still reading this one but should finish it today or tomorrow. It’s one that was written in the 1920’s and is rather fascinating. Four women on holiday in Italy for a month, all quite different. The Sound of Glass…what an intriguing title! Yes, hardbacks can be expensive! I like the cover of The Enchanted April. I do hope you are feeling better. Happy Reading! Glad you are feeling better. I remember reading Enchanted April and liking it. I think it was for book club, and then we watched the movie, which is also good. I’m so sorry you weren’t feeling well. I’m absolutely craving a walk on the beach! I’m sorry you got sick, but so happy you are feeling better and up and about. Walking along a beach sounds lovely. We aren’t close to a beach around here; it’s more of a regional park of paths by the bay which smells like rotten eggs, probably due to the nature reserve around it. I have several of Karen White’s books on my TBR. I wasn’t a big fan of On Folly Beach but will try to give other books of hers a try. I’m glad you are feeling better. The Enchanted April looks good. The Girl He Used to Know is on my TBR, I can’t wait to read it. I am glad you are feeling better! And The Sound of Glass is the book that got me hooked on Karen White! Sooo good!!!!!! The Sound of Glass was a good read…I always LOVE her books. LOVE the cover on The Enchanted April. I love the cover of The Sound of Glass – the colors of beach glass are so pretty and well, beach-like! Also love your description of walking on your own beach as like paradise – sounds lovely! We went to the beach 2 weeks ago, but it was very cold and windy – still nice to be near the ocean, though. The Enchanted April is one of many classics I keep meaning to get to – glad you’re enjoying it. 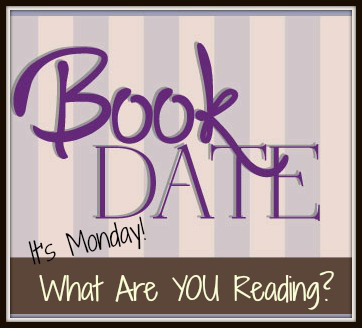 Have a good week, enjoy your books, and thanks for hosting the link-up! Oh my…I am so sorry you weren’t feeling well. I missed you last week and wanted you to see my post of cozy nooks because many of the quilts I made were there. Stay healthy! Your book choices this week look yummy! Walking on the beach sounds wonderful. Glad you’re feeling better! I liked the Karen White book. Sorry to hear you haven’t been feeling the best, and pleased to know that you are now on the road to recovery. The weather here, in the south of the UK, has been pretty nondescript, although yesterday there was a welcome break and spring was really in the air, with wall to wall sunshine and blue skies. I really like the sound of ‘Breaking Glass’, however the jury is out on ‘The Girl He Used To Know’, so I’ll wait to see what you think of it first! Glad to hear you’re on the mend. Enjoy your books. I’ve seen The Girl He Used to Know around a lot of blogs, so I’m eager to read your thoughts on it. Enjoy your week. Sorry to hear you haven’t been feeling well, glad you are recovering. The weather has been pretty awful here, overcast and humid mostly. Glad you are feeling better. Thanks for hosting. Have a great week! The weather was briefly nice here and I made it down to our local historical garden to photograph flowers and chickens. Oh, I’m glad you’re feeling better. Being sick is no fun at all, especially when we don’t even feel like reading. I like the look of The Enchanted April…beautiful cover, too. I want to read The Girl He Used To Know. I love walking on a beach, listening to waves roll in. Glad you’re feeling better, and hope that continues! Glad you are feeling better. Karen White always tells a great story.